Opener message from Shaka Ssali: Today on straight talk Africa, a look at the developing political situation in Uganda, the discussion on the current democratic challenges in Uganda. 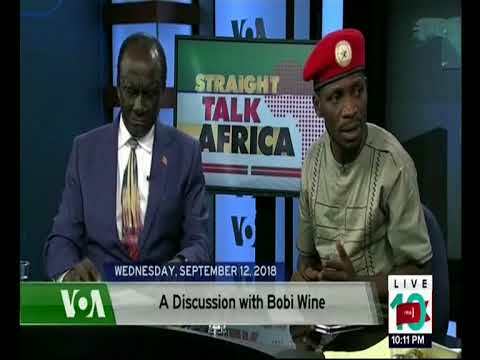 Bobi Wine: I salute you fellow Ugandans back home and other citizens across the globe. Shaka Ssali; Bobi wine you came on clutches, why? Bobi Wine: I came on crutches because I was in deep pain, I’ve been treated well by doctors back home and here and I hope to be back on my feet very soon. Response from Ambassador Katende: As an Amb, I took the responsibility to look Hon. Bobi Wine up because I saw him coming on crutches. I now see him with a walking stick which means things are getting better. There’s been a lot of information circulating on social media that there’s a crisis in Uganda but I want to assure people that there’s no crisis, we only have acts of criminality. Uganda remains committed to democracy, rule of law and respect for human rights. The issues Hon Kyagulanyi has alluded are before court and it will pronounce itself on it. Uganda doesn’t condone torture and whatever issues the hon. has will be pronounced in court, Uganda has functioning institutions. Bobi Wine: I’m here to speak for millions and millions of Ugandans especially the young people, I’m here to represent their reality. Bobi Wine: I wonder what kind of functioning institutions Ambassador Katende is talking about, power resides within the presidency. Ambassador Katende; The most important thing is that the people of Uganda have a voice and remember that you are here for treatment because the courts have granted you bail, that’s the democracy I am talking about because you are also enjoying it. Ambassador Katende: Uganda is governed by a constitution which is the supreme law of the land, it has provisions governing all facets, the change of term limits was subjected to the people of Uganda. What is true is that Parliament represented that provision on behalf of the people, we practice democracy because part of the people in parliament said no to it. We have a parliament that has all shades of political interests, we have FDC, UPC, NRM, DP, JEEMA and the Kyagulanyi’s. We have a parliament that should be respected and if not, when Hon. Kyagulanyi leaves here, he should resign. Ambassador Katende: On the issue of delving into the past, we’re not coming from nothing, Uganda didn’t start when Bobi wine became an Mp, Uganda is old and we have institutions that have been built over time. We have rule of law, we have courts, the same courts that granted Bobi Wine bail to be here in the USA. When matters don’t favor those who are opposed to government then they’re illegal and wrong, when they favor them, then they’re okay. President Museveni actually has support, what you see is political leaders formatting disturbances in town. If it was about cheating, then team Bobi Wine wouldn’t have won in Arua and Bugiri. Shaka Ssali: What do you stand for? 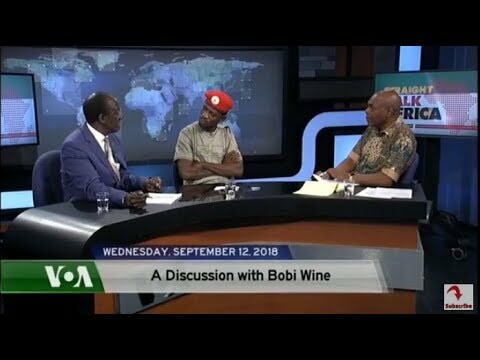 Bobi Wine: I’m here not to speak only for the opposition but for the people of Uganda especially my generation, the generation you clearly don’t understand and not connected with.